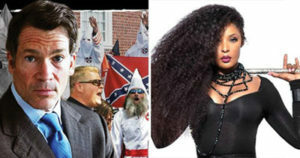 NATIONWIDE — Attempt by hedge fund billionaire Louis Bacon of KKK heritage to end legal effort of an indigent disabled Black woman on social security reveals that unbeknownst to her, his Hollywood superstar lawyer, Marty Singer, was also secretly embedded in her legal camp. Inquiring minds want to know how it is that Bianca McKinney (“McKinney”), an indigent disabled Black woman on social security in the USA, could have survived the herculean attempt by hedge fund billionaire Louis Bacon (“Bacon”) to strike out her California, USA multimillion dollar lawsuit jointly against him and Michael Artan (“Artan”), a California-based Criminal Defense Attorney. In civil case No. BC-624474 initiated by McKinney on June 21, 2016; in the Superior Court of California by her first attorney, Michael Saltz (“Saltz”), she jointly sued Bacon and Artan for (1) Fraudulent Concealment, (2) Invasion of Privacy, (3) Intentional Infliction of Emotional Distress; and (4) Violations of the Bane Civil Rights Act. Although McKinney’s claim had technical defects based on the way it was initially formulated by Saltz, within six months of it having been started, presiding Judge Howard L. Halm allowed McKinney’s then new highfalutin Hollywood attorney, Marty Singer of Lavely & Singer (“Singer”), to fix those defects by amending the claim on three separate occasions over the ensuing one and half years. In December 2017, after Singer had unbelievably failed on the third occasion to reach the very low bar for amending McKinney’s claim, Judge Halm acceded to Bacon’s request to strike out the first two listed causes of action as against Ba-con. They were related to attorney-client relationships. Because of Bacon’s arguments against Singer’s inadequate rebuttal, those two causes of action seem also to have fallen as against Artan, freeing him from what ought to have been a straight forward lawsuit in professional malpractice for fraudulently filing a lawsuit in McKinney’s name without her knowledge or consent. How is it that Singer, considered to be one of the top litigators in Hollywood, failed on three occasions to properly amend McKinney’s claim such that the low-lying allegations of fraud against Artan could be sustained against any formal objection by Bacon by what is called a “demurrer”? From Renegotiate.org’s view point, Singer’s failure to defeat Bacon’s demurrer, seems to be rooted in the questionable strategy of having both Artan and Bacon sued jointly in the same case and in relation to the first two listed causes of action which were lawyer-related. This type of professional blunder is reserved for novices if ill-intent is not obvious. The question which begs an answer is why it is that Singer took McKinney on as a client in the first place? After all, she does not fit the profile of Singer’s client-type; being rich and famous. Singer is known as being the ‘clean-up lawyer’ for the rich and powerful when they are faced with salacious and/or criminal scandals. By McKinney’s lawsuit, however, she is allegedly a victim of Bacon and virtually unknown by the standards of Singer’s client-type. That said, McKinney’s lawsuit did get international recognition in June 2016 in front page articles of the New York Post and Daily Mail about Bacon attempting to coerce her into being a pawn in an ongoing battle between him and his neighbor in the posh Bahamas Lyford Cay Subdivision, 75-year old, Peter Nygard, a Canadian Fashion Mogul. According to the court papers, a media blitz of McKinney’s lawsuit happened just months before Singer appeared on the stage for McKinney. By McKinney having the audacity to sue Bacon for intentionally inflicting emotional distress on her, she had become what some say is a problem for him that could be handled in the way Singer is known to do for his countless well-known and wealthy clients. Unsurprisingly, on 29 March 2018, about 1 1/2 years after having Singer nestled in McKinney’s legal camp as her lead litigator, that professional relationship ended abruptly. Singer asked the court for and was granted an order to be relieved as McKinney’s attorney. Why would Singer abandon McKinney at a time when she had some measure of success against Bacon? She had been granted a jury trial date for February 2019. That would have led Bacon to having to be deposed and potentially cross-examined in open court about the allegations; an undesirable prospect for a secretive person. In a mind spinning real life cloak and dagger drama, it turns out that since at least 2011, Singer was also attorney for Bacon, McKinney’s opponent in this very lawsuit in which she is suing Bacon. Does this now explain why the highfalutin Singer seem to have jumped into McKinney’s lawsuit against Bacon as her lead litigator? Did he use his celebrity, like a villainous bully, to elbow his way into that position of confidence for doing effective damage control for his client, Bacon? Based on court documents, this situation became exacerbated by the fact that Singer was Bacon’s Attorney at the same time when Artan was allegedly filing a fraudulent lawsuit in McKinney’s name against Nygard, the subject matter of this law suit. With this, Bacon’s alleged connection to Artan, Singer, Palladino, and his associates; gives sinister meaning to the adage, “birds of a feather flock together”. It is not unlike a figurative ‘murder of crows’, especially when considering that these are all White people focused on destroying McKinney, a Black woman because she had refused to be made a part of their conspiracy to destroy Nygard’s reputation by perjuring herself in that New York lawsuit. By McKinney’s court documents, a woman called Sara Ness was allegedly hired by Palladino to locate the Black model and hip-hop artist to convince her to perjure herself in order to falsely jail Nygard. Now that McKinney has survived Bacon’s attempts to strike-out her lawsuit, although she was without a lawyer at the time we went to press, Bacon’s lawyers have filed an application for Summary Judgment based on the questionable strategies advanced and presided over by Singer as McKinney’s lead litigator. According to court papers in a New York lawsuit brought by Bacon against Nygard, Palladino (for whom Ness worked) is referred to as “…Bacon’s private investigators” when they acted as the money negotiator with a former employee of Nygard, Stephen Feralio (“Feralio”), who was allegedly paid by Bacon to misappropriate private and confidential material from Nygard and deliver same to Bacon for which Feralio was to be “…richly compensated”. Based on court papers, McKinney alleges that Bacon hired Palladino through the New York-based self-described “international risk consulting and intelligence firm”, The Arkin Group and its principles, Attorney Stanley Arkin and Jack Devine, former chief of CIA worldwide operations. As such, with Arkin, Palladino is said to have direct involvement in concocting the false story put forward by Artan in July 2011 fraudulently in McKinney’s name. Related facts of that story have been repeated in a March 2017 internet publication by Jestan Sands, also a former employee of Nygard who, like Feralio and Artan, is allegedly hired by Bacon to make up salacious and untrue things about Nygard. Then, abled bodied feisty International model, McKinney, had taken up a modeling contract with Nygard that, on USA Independence Day in 2008, would take her on the runway of the Bahamas-based world-renowned Bob Marley Resort. Disrespectful of the Bahamian people being proud of their African heritage, Bacon was publicly lying in his attempts to take credit for leading a 1999-2004 grassroots movement in The Bahamas that saved good conditioned slave ruins and remnants of their history of strength and freedom. The Bahamas is made up of more than 99% Black and non-White people. Oxymoronically, as a native of the Carolinas, Bacon is charade as the savior of the heritage of Black slaves who, after USA Independence of 1776, had migrated from the (racist) Carolinas to The Bahamas where they enjoyed a greater a degree of freedom and equality. There are those who say that Bacon came to The Bahamas to figuratively recapture runaway slaves from the Carolinas and continue with the brand of racism of his maternal ancestry. Ultimately, he would seek to punish anyone who aid such Black people in the enjoyment of their freedom of mind, expression, movement or body. As such, it appears that McKinney, as a Black woman in The Bahamas at the time, was supposed to have simply fallen in line, aid and abet Bacon’s alleged ignoble motive with Nygard as a primary target of racist scorn. So, it appears that Singer, like Artan and Palladino, was in the employ of Bacon at the at all material times, working to get close enough to McKinney to use her and then influence her decision toward achieving a racist plot against Nygard and the Black people in The Bahamas and their cousins in the USA. No doubt, controlling any damage that could be inflicted on Bacon appears also to have been the result of what Singer caused by abruptly abandoning McKinney. As Bacon now seeks to add more out-of-state lawyers to his already large legal team against this indigent, disabled Black woman on social security representing herself, the thought-provoking question is why is Bacon executing what appears to be an ‘over-kill’ strategy? Fear of being exposed?